Below is an interview on balance ratios and the risk of developing chronic ankle instability (CAI) and ankle instability in swimmers. Is balance known to increase an individual’s risk for injuries? Here is the latest article by Erik A. Wikstrom “Chronic ankle instability” A Systematic Review, his latest studies and complete research work sites can be found here. 1. Do patients who have Chronic Ankle Instability use sensory information differently than those without? It would appear that they do. This is important because sensory integration is critical for the development of appropriate motor commands. Sensory integration refers to coordinated adjustments in sensorimotor control that are orchestrated by spontaneously reweighting. Among visual, vestibular, and somatosensory input based on the task being completed and the environment the task is being completed in. If we walk to the bathroom during the at night. We complete the task of walking, but our reliance on visual information.The degradation of sensory’s are related to aging and neurogenic diseases. There is a growing body of evidence to suggest that sensory acuity declines following musculoskeletal injury. For example, research has shown declines in the accuracy of somatosensory input in those with CAI (i.e., plantar sensation and proprioceptive). 2. How does this affect a person’s balance? 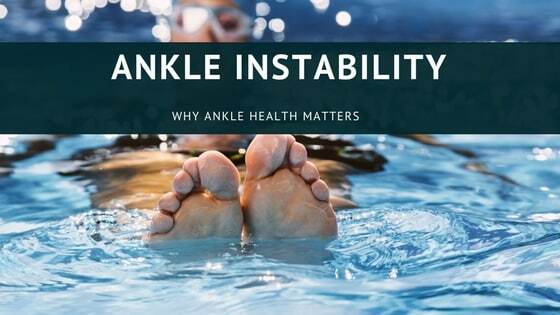 How does ankle Instability affect swimmers? In brief, negatively. Our ability to spontaneously reweight among our sensory inputs varies from person to person and is based in part on our own experiences and abilities. Research suggests that the alterations observed in those with CAI negatively impact balance and poor balance is known to increase an individual’s risk of sustaining a lateral ankle sprain. A recent systematic review examined balance ratios calculated from eyes open and eyes closed balance assessments in those with CAI and uninjured controls. There is a larger degradation of balance when a participants eyes were closed. Participants with larger ratios are considered to rely more on visual information when their eyes open. The increased use of visual information also appears to limit the ability of CAI patients to reweight among sensory inputs. This trend has been observed both when their eyes are open and when their eyes are closed. These results are problematic because we rely on visual information to determine the location and movement of objects surrounding us. As well as picking up other environmental cues (e.g. a street light has turned red) to keep us safe. 3. Who might be at risk for ankle instability? Anyone who initially sustains a lateral ankle sprain is at risk to develop CAI. At least 33% of people who sprain their ankle will develop CAI. At this time, we are unable to predict which individuals are most likely to develop CAI, so we recommend everyone seek out a health care provider and adhere to their prescribed rehabilitation program following an acute lateral ankle sprain. 4. Does this translate to deficits in other areas of the body? Lateral ankle sprains are minor musculoskeletal injuries that heal on their own. Unfortunately, this is not the case for most patients who sustain a lateral ankle sprain as we know that lateral ankle sprains and CAI patients have a variety of structural and neuromuscular adaptations. Adaptations have been at the knee and hip. CAI decreases an individual’s physical activity levels. Injuries start as a peripheral musculoskeletal injury but transforms into a neuromuscular injuries. This ultimately impacts how the central nervous system organizes sensory information and generates motor programs. 5. What types of injuries are common in those with CAI? The most common injury sustained by those with CAI are recurrent lateral ankle sprains. Those with CAI often have episodes of giving way as well. These are events where the ankle “feels” like it is going to give out. There is evidence that indicates an increased risk of an Anterior Cruciate Ligament (ACL) injury in those with a history of a lateral ankle sprain. 6. Can a patient do anything to correct this? There are a number of things an individual can do to try to prevent the development of CAI and/or treat CAI. First, seek medical care for all lateral ankle sprains. Second, protect the ankle during the initial phases of healing. Controlled loading (i.e. walking with support) is ok, too much loading too early is a risk factor for CAI. An elastic wrap alone is not enough support. Individuals with acute lateral ankle sprains should initially wear a brace and restrict all painful movements. Rehabilitation is effective in the treatment of acute lateral ankle sprains and CAI. Current recommendations include a comprehensive approach that focuses on restoring appropriate range of motion, strength, and neuromuscular control. Ankle joint mobilizations, calf stretching, plantar massage, strength training via elastic bands, and balance training are all excellent modalities. Exercises can be used to treat lateral ankle sprains and CAI. 7. What else do we need to learn about in regards to the causes and effects of chronic ankle instability? Almost 80% of individuals develop post-traumatic ankle osteoarthritis, but progression of the disease and the effectiveness of both conservative and surgical interventions at mitigating disease progression remain unknown. 1.Hoch MC, McKeon PO, Andreatta RD. Plantar vibrotactile detection deficits in adults with chronic ankle instability. Med Sci Sports Exer 2012;44:666-672. 2.Powell MR, Powden CJ, Houston MN, Hoch MC. Plantar cutaneous sensitivity and balance in individuals with chronic ankle instability. Clin J Sports Med 2014;24:490-496. 3.McKeon JM, McKeon PO. Evaluation of joint position recognition measurement variables associated with chronic ankle instability: a meta-analysis. J Athl Train 2012;47:444-456. 4.Wikstrom EA, Hubbard-Turner T, McKeon PO. Understanding and treating lateral ankle sprains and their consequences: a constraints-based approach. Sports Med 2013;43:385-393. 5.Hertel J. Sensorimotor deficits with ankle sprains and chronic ankle instability. Clin Sports Med 2008;27:353-370, vii. 6.McKay GD, Goldie PA, Payne WR, Oakes BW. Ankle injuries in basketball: injury rate and risk factors. Br J Sports Med 2001;35:103-108. 7.Beynnon BD, Renstrom PA, Alosa DM, Baumhauer JF, Vacek PM. Ankle ligament injury risk factors: a prospective study of college athletes. J Orthop Res 2001;19:213-220. 8.McKeon PO, Hertel J. Systematic review of postural control and lateral ankle instability. Part I: can deficits be detected with testing? J Athl Train 2008;43:293-304. 9.Song K, Burcal CJ, Hertel J, Wikstrom EA. Increased visual utilization in chronic ankle instability: a meta-analysis. Med Sci Sports Exer 2016. 10.McKeon PO, Booi MJ, Branam B, Johnson DL, Mattacola CG. Lateral ankle ligament anesthesia, alters single limb postural control. Gait Posture 2010;32:374-377. 11.McKeon PO, Stein AJ, Ingersoll CD, Hertel J. Altered plantar receptor stimulation impairs postural control in those with chronic ankle instability. Journal of Sport Rehabilitation 2012;21:1-6. 12.Hertel J, Guskiewicz KM, Kahler DM, Perrin DH. Effect of lateral ankle joint anesthesia on center of balance, postural sway, and joint position sense. J Sport Rehab 1996;2:111-119. 13.Corbin DM, Hart JM, McKeon PO, Hertel J. The effect of textured insoles on postural control in double and single limb stance. J Sport Rehab 2007;16:363-372. 14.Smith RW, Reischl SF. Treatment of ankle sprains in young athletes. Am J Sports Med 1986;14:465-471. Peters JW, Trevino SG, Renstrom PA. Chronic lateral ankle instability. Foot Ankle 1991;12:182-191.